Jersey champions St Paul's completed a clean sweep of the five competitions they entered this season by beating Jersey Scottish 3-0 to retain the Le Riche Cup. Craig Russell's early effort was followed by further first-half goals from Scott McClurg and Luke Watson. Saints have also won the Upton, the Jersey Premiership, the Wheway Cup and the Charity Cup this season. Their only loss was a 2-1 league defeat by Trinity in April. "To win five trophies makes it a brilliant year," St Paul's manager Paul Brannan told BBC Radio Jersey. "It's been a huge amount of work behind the scenes, I'm very lucky to be supported by a fantastic club and fantastic committee. 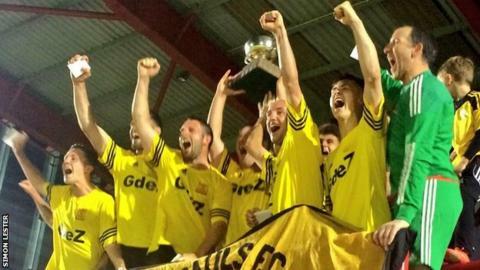 St Paul's did not lift all six trophies available to top-flight Jersey sides because they decided not to enter the Jeremie Cup, having reached the previous five finals of the Guernsey FA-run inter-island event. However, it is only the second time that a Jersey side has won all the silverware available to them - St Paul's won all six in 2009-10. The record for a Channel island club is seven trophies, won by Guernsey's Sylvans in 1997. "We have a group of players who have a desire to win like nothing I've ever seen before," Brannan added. "When you're at a top club like St Paul's you're ambition is to be successful - to win all five trophies is what you aim for, that's the dream, but realistically it's a lot harder to achieve. "In all honesty I'd thought my first year would be a tough task, but to do it is something special."